Are you wondering how to bake meringue? Luckily the secrets to a great meringue are not difficult to master. Learn how to bake meringue and impress your friends with some fantastic desserts. While there are many variations of a classic meringue, meringue by its very definition is egg whites and sugar beaten until the air is thoroughly incorporated, thus making the confection form "stiff peaks." Generally, vanilla, almond, or coconut flavoring is added as well. It is then baked until just the tips are a golden brown. Meringue can be served alone with syrup, but is often used as a topping for a custard-like pie such as in lemon meringue pie. Despite the fact that meringue has only two ingredients, it can be tricky to yield results that are just perfect. 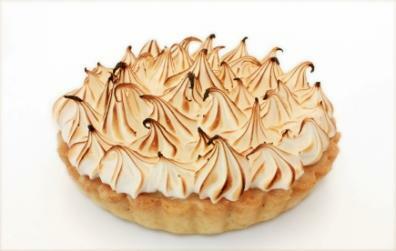 If you are wanting to bake the perfect meringue pie, you first have to make flawless meringue. Make sure your mixing bowl and utensils are shiny clean. Meringues are finicky and any trace of dirt, oil or grease can ruin your best efforts. Likewise, make sure that you use a stainless steel or glass bowl. Plastic mixing bowls can harbor leftover oil which will in turn affect how well the egg whites "rise". Separate cold eggs. Eggs separate more easily when they are chilled. The catch is that egg whites beat better when they are room temperature. Therefore, take your eggs out of the fridge, separate them immediately, and then let the egg whites sit for about half an hour until they are room temperature. Be careful when separating the yolk from the white. One common pitfall in making meringue is the assumption that just a little bit of yolk won't do any harm. Nothing could be more wrong. A little bit of yolk goes a long way towards ruining an entire meringue. For this reason, it's a good idea to separate into one bowl, and then dump your separated egg white into a larger bowl. That way if some yolk does make it into the white by accident, you only have to throw out the little bit rather than the whole batch. Add the sugar gradually. Sugar should be carefully poured into meringue by the tablespoon. The method that will yield the best results is to add the sugar while beating. Pipe meringue onto hot "fresh out of the oven" filling. The heat from the hot filling helps cook the meringue and helps prevent cracking. Always set meringue in the middle rack of the oven. Ideally you want the peaks to browned but not too brown. Make sure that when you are covering the hot filling with meringue, that you cover the pie completely and "seal" the edges well. Meringue has a tendency to separate and the extra attention to this small detail will help the pie look aesthetically complete. You can seal the edges by making sure that the meringue covers the hot filling and the pie crust.